Free Shipping Included! 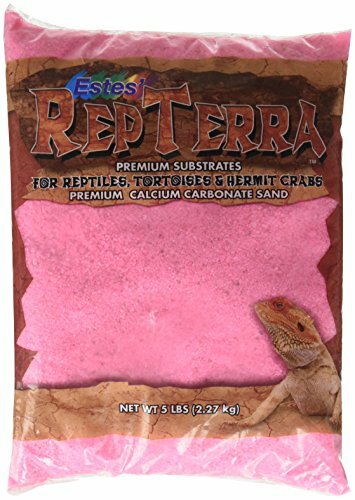 Estes' Gravel Products SES62105 5-Pack RepTerra Reptile Calcium Carbonate Sand, 5-Pound, Pink by Estes' at Pet-O-Institute. MPN: 346102. Hurry! Limited time offer. Offer valid only while supplies last. Estes Gravel Rapture sand is a perfect sand for reptiles and hermit crabs. Made of calcium carbonate that provides a necessary source of calcium. Estes Gravel Rapture sand is a perfect sand for reptiles and hermit crabs. Made of calcium carbonate that provides a necessary source of calcium. Features natural vegetable based colorfast food grade dyes and coating. Available in pink color. This product weighs 5-pounds. Includes 5-pieces per pack. If you have any questions about this product by Estes', contact us by completing and submitting the form below. If you are looking for a specif part number, please include it with your message.